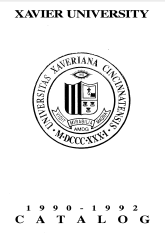 Xavier University Bulletin. Vol. XXVIII September, 1944. No. 3. Evening Division Liberal Arts Commerce and Finance. 1944-1945. All Courses open to Men and Women. Downtown College 520 Sycamore Street.